In Part One we looked at the basics of video production monitors and how to go about choosing them. In this part, we’ll look at some examples and accessories. Monitor shortcomings are never marketed. Ultimately, even the perfect monitor on paper might prove inadequate in the field. Therefore, this is one area that you mustn’t get into without direct experience. If that isn’t practical, then at least get opinions from multiple sources. All said and done, if you still find it hard to choose after having done all that research, go with your gut. If you have the specifications right, then your decision can’t be all that bad anyway. Use a viewfinder or the LCD display on your camera. If for some strange reason you want to be away from the camera and still monitor over a 3″ display, then use wi-fi technology to stream to your smartphone. 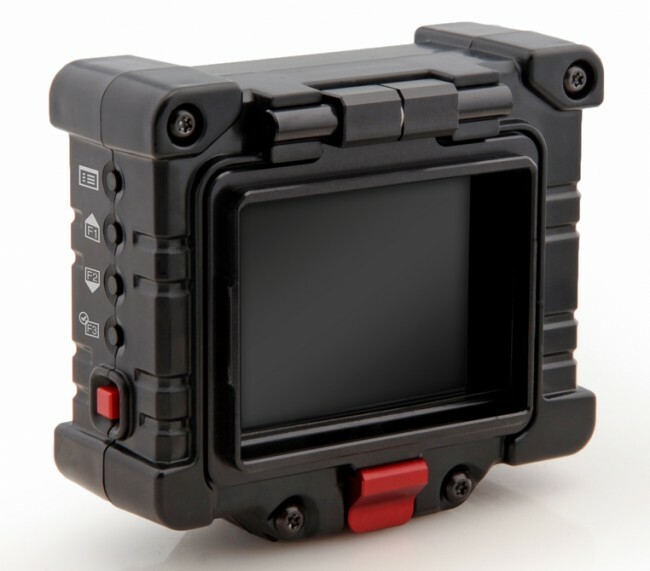 HDMI – Use Viewfinder or LCD, or something like the Zacuto Z-EVF-1F EVF . These options double up as a viewfinder if you buy the whole kit, and comes with many useful features. What does a top of the line monitor get you? Full resolution, robust build quality and greater accuracy. Compare the higher end models with the Lilliput, for example, and you’ll also see better controls via knobs. The big challenge for the 9-10″ sized monitor is to match the retina display, which is undoubtedly a great benchmark for resolution, if not color. As we saw in Part One a 10″ monitor needs a resolution of 1080p to shine. The Apple iPad with Retina Display can also be a contender with Wi-fi streaming but beware of the lag times. Curiously, there is a 4K option at this size, the Blackmagic Design Smartscope Duo 4K, though it is for input only. The display is not 4K. This is where things get slightly murky. Do you opt for a laptop with a device like the Blackmagic Design Pocket UltraScope or should you stick to a professional-grade monitor? If portability is key, then only production monitors will do. I see no reason to spend money on a professional-grade monitor in this case. It’s too small for a video village and too large for focus pulling. My suggestion? Stick to a laptop. I have no hesitation in recommending a Apple MacBook Pro . Don’t forget – many monitors can take both HD-SDI and HDMI inputs via an optional adapter, if not directly. The 17″ size is interesting. Most laptop manufacturers have somewhat settled on this size as the upper limit of portability. I’ve owned a 19″ laptop and I can tell you it is anything but portable. Again, I don’t see much need for a 17″ monitor on set. It’s okay for a DIT but I would look at 21″ for 1080p. Most consumer-grade displays will do, provided it is robust enough. A professional-grade monitor in this size is serious money (and not worth it if you ask me) just for framing and focusing. A 21-24″ monitor must deliver on color. More often than not a director or client makes decisions from what they see on this monitor. For the reason mentioned above I won’t recommend the cheap consumer grade monitors. However if you don’t have money for a good monitor but still need a 24″ display, take a look at the Dell UltraSharp U2410 . For 4K, the Dell UltraSharp UP2414Q should be good. 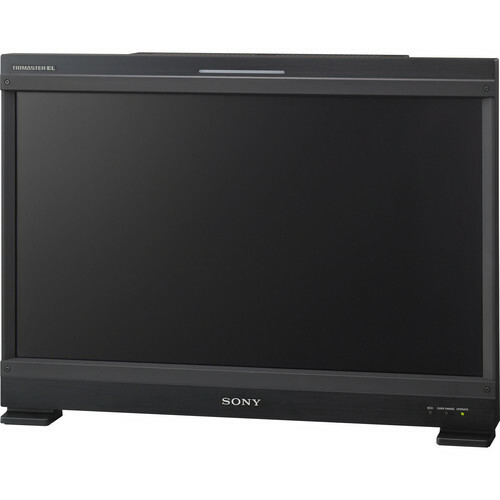 The excellent Sony LMD-2110W is more robust than the Dell displays and can also take HD-SDI with an optional adapter. HDMI – Sony LMD-2110W which can also take HD-SDI with an optional adapter. The Marshall Electronics QVW-2410 accepts DCI 4K as well as Ultra HD, but will only display 1080p. This is a good starting point for 4K displays. However, they are not too portable. Also, the cheaper ones are not production monitors, but just consumer displays. Production monitors at these sizes are rare and expensive, so if you have an HD-SDI feed you might want to consider an HD-SDI to HDMI converter (or the other way around; like the ones Kramer , Blackmagic Design or AJA makes) and use a cheaper panel instead. You would be using these sizes in the video village or for watching dailies. Focusing and Framing – Any cheap monitor will do. For 4K, take a look at the cheap but huge Seiki monitors. 4K – How about a 105″ Ultra HD monitor? It’ll blow the socks off any projection system out there! For professional grade 4K, try the Sony SRXT105. For the price of a 4K monitor, one could potentially make a movie. One shouldn’t expect the kind of color quality from large monitors as one would find on smaller monitors, so it’s better to use smaller monitors for critical evaluation and larger monitors just for framing and dailies. When you have one monitor, you have no option but to trust it. When you have two, showing dissimilar images, which one do you believe? This happens more often than not. The more the devices, the worse it gets. For these reasons, when a lot of signal is flowing around on set, the only way to keep everything under control, is with signal testing equipment. If you want a PC setup for your data station, you could use the Blackmagic Design Ultrascope Card instead. These are okay tools, and probably good enough for simple testing. When everything is hunky-dory, they work. But when signals misbehave, they are lost. Personally, I find it more beneficial to trust the in-camera monitors over cheap solutions, but cheaper cameras don’t have internal monitoring. For professional grade testing systems, look at the products made by Leader and Tektronix. Picture controls like color temperature, brightness, contrast, gain, bias, monochrome, safety, etc. HDMI is a difficult standard to monitor, simply because it only specifies ‘how’ a signal should be packaged, not ‘what’ that signal should be – unlike HD-SDI. In fact, it is surprising that technology has gone miles ahead, while those making the standards are still scratching their heads. Can’t blame them. It’s changing too fast! Take a look at the Tektronix WFM2200. The more the systems, the more running around an engineer might have to do. Try the Tektronix PQA600 system. What if you’re shooting RAW? RAW means the signal only contains data in a specific format. There is no color space or ISO attached to it, even though it will have a gamut (which is defined by the sensor-sampling system within the camera). Arri Alexa – Arriraw – DVS Clipster, or the Arri products – Arri Look Creator, Arriraw Converter and LUT Generator. For more information on RAW, check out my series on Deconstructing RAW. For a detailed comparison of on-set ingest and logging software (which includes monitoring and color), click here. You need these to test systems against a standard known type of signal (a good generator will give you many options), and to generate a pulse to synchronize systems perfectly, like in the case of live broadcast switching or stereoscopy. Check out these signal pulse generators from Tektronix. Tools to check other tools? If you want to keep your testing system sane and healthy, and have the knowledge to do so, you should always have a multimeter in hand. Check out these digital multimeters from Tektronix. What I’ve outlined here barely scratches the surface. 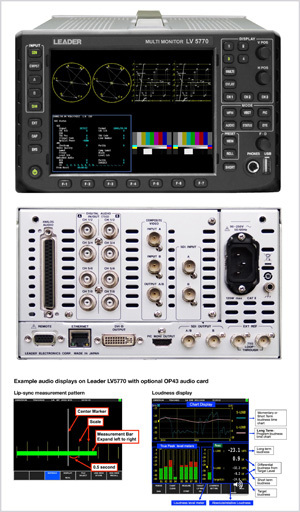 Testing signals, be it in file form (RAW or otherwise) or signal form (HD-SDI, HDMI, etc. ), is not an activity to be taken lightly. It is a good idea to rigorously test products often, so that you know they are performing to their utmost. For further research, I highly recommend the Tektronix Learning Center. The most important color space, common to all the cameras in this guide, is Rec. 709, which is the world-wide standard for HDTV. This space corresponds to sRGB, the universal standard for consumer monitors. Anything beyond this is called ‘wide gamut’. A wide gamut monitor is capable of displaying colors outside this norm. Note: A wide gamut monitor does not mean it can show every color, just a few more colors outside Rec. 709 (assuming it is the base standard they chose for their marketing). A camera sensor is made of real physical material that interact with light. The resulting electrical signal is sampled via internal circuitry. This process ‘reigns in’ the colors under an established color space, like Rec. 709, while discarding the rest. A good HD camera will have a sensor system capable of producing color far greater than Rec. 709, so that eliminations can be made without penalty. This is where RAW comes in. By delivering raw, camera manufacturers are giving you the power to choose your working color space. How do you know RAW has more color than a ‘baked’ image? Check out my Dynamic Range comparison of RAW v/s video mode on the Canon 550D article for starters. Eventually, be it raw or cooked, an image will be delivered to the monitor, and the monitor, being an object made of real atoms and molecules, will have its own color gamut. A wide gamut monitor will usually accommodate most of Rec. 709 (or even 100% of it). It also has ‘space’ for additional colors that one hopes is within the raw file gamut. But who can say for sure? The above diagram is not to scale, so don’t get too worked up over it. A well designed system keeps things within the ‘ball park’, so to speak. To know more about color, please read Driving Miss Digital. Two excellent systems for your external monitor are the Datacolor Spyder4Elite and X-Rite i1 Display Pro . To ensure color accuracy, you will do well to also use the color charts that come with the calibration system. To test focus, I suggest the LensAlign MkII Plus Focus Calibration Tool . For white balance, you could use a foam board, or a more robust tool like the Lastolite 12-Inch Grey/White Card . If you want to check for sharpness, you will also need a resolution chart, like the ones made by DSC Labs. You could print your own copy of the 1951 USAF resolution test chart and its variants, if you want to save money. Always have black cloth handy for those really troublesome days. At least no one will see your tears of joy on achieving the perfect shot. That’s about it. 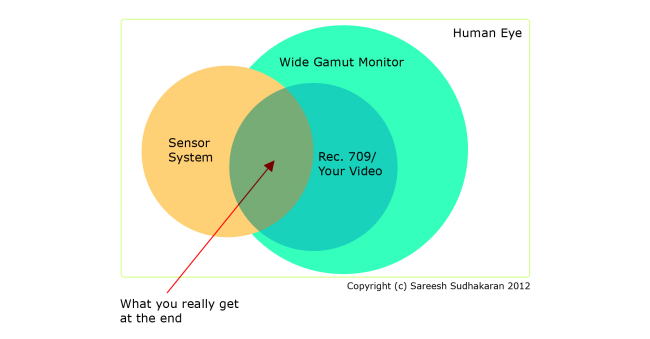 We’ve covered a lot of ground about what makes a good video production monitor and how one should use it for best advantage. Who would have thought such a simple looking thing could be so complicated? johnamsterdam They are not monitors, but recorders with monitors. Sareesh Sudhakaran johnamsterdam I actually don’t know what I want, I just see that these popular monitors I mentioned are not listed here. johnamsterdam That’s good news! The important is, you already know what you want. I’m missing Atomos Ninja and similar types of monitors here. 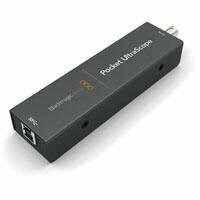 Another good scope option is http://www.divergentmedia.com/scopebox software. It’s only $99, though of course you need a computer to run it. I ended up buying the Ikan because the Small HD was hard to get the colors right.